All groups welcome new members. Information is provided on each of the group’s pages and each also has a contact number. Joining a group is a good way to get to know others in the parish, to serve the parish and to live out your faith in a positive way through active participation. The Pastoral Parish Council meets four times a year. 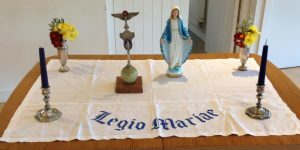 During this meeting they discuss a number of areas in the parish which include fundraising, communion visits, safeguarding, social events, the Treasurer reports back from the Fabric and Finance meeting, as well as discussing youth initiatives and objectives etc. Fr Bede, the Parish Priest chairs the meeting and is supported by Julia Yardley, Jacky Tucker, Charles Rossiter and Christine Davies. The Fabric and Finance Committee meets four times a year to look at the financial and fabric side of the parish. We look at the income from the parish community and also look at the expenses that are incurred in the running of the parish. We also look at any building works or problems with the parish building/site itself. Fr Bede, the parish priest, chairs the meeting and is supported by Julia Yardley (Treasurer), Denis Barnes and Jacky Tucker. It is a lay Catholic organisation whose members are giving service to the Church in almost every country. These parishes make up the Glastonbury Deanery and Fr Louis Beasley Suffolk VF is the Dean. It is a great opportunity for clergy and laity to share what is happening in their parishes and also to strengthen communities by working together and supporting each other. St Michael’s Parish encourages all to volunteer their services in some way to help support and build up our parish community. Alongside are some ways in which you can do this. 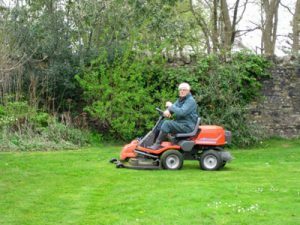 If you feel you would like to become involved in any way or would just like to know a little bit more, then please contact Fr Bede who can put you in touch with the right person. To serve at the altar is a great privilege. Servers assist the Priest on the sanctuary. Servers can volunteer after receiving their First Holy Communion. They receive training sessions and then begin serving. Servers need to be at church at least ten minutes before the start of Mass. 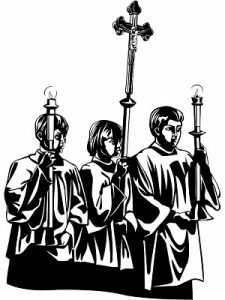 If you would like to be an Altar Server please speak to Fr. Bede. The flower arrangers decorate the Church with floral arrangements for Mass and for special occasions. 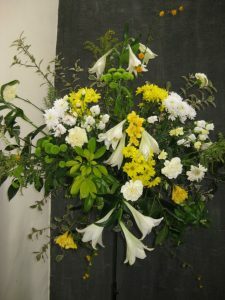 The group creates the flower arrangements, co-ordinating them as appropriate with the Liturgy. You can help by joining them, or by offering flowers. The flower arrangers volunteer on a rota basis. If you are interested, please contact Lucy Harris on 01749 830952. Readers have the responsibility to read one of the readings during Mass and/or the Prayers of the Faithful. The aim is to read and proclaim the Word of God in a manner that the congregation can hear clearly, with intonation that aids understanding. Training will be given to new readers. If you would like to find out more about being a reader please speak to Fr. Bede. Welcomers greet visitors and parishioners as they come to Mass. They aim to offer a smile and a few friendly words to as many people as possible, whilst handing out the hymn books, Mass leaflets and the weekly Bulletin in the church porch. You can help by joining the Welcomers rota. 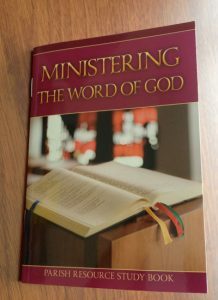 This requires you to be at the church about half an hour early when it is your turn, to arrange the books and newsletters prior to handing them out. If you are interested in volunteering to go on the rota please contact Jacky Tucker on 01749 830695. If you would like to help with organising and supporting either specially planned activities for the young people or with the re-formation of St. Michael’s Youth Group or Mini Youth, please do speak to Fr Bede. There is no Coffee Morning in March, but instead there are two Lenten Lunches arranged – Wednesday March 13th and Wednesday April 3rd. 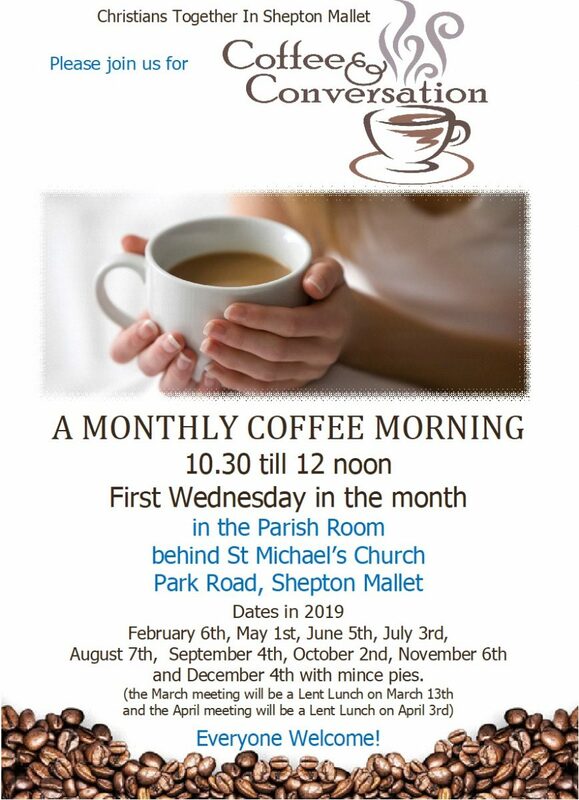 Hot home made soup and a roll, plus tea or coffee will be served in the parish room between 12.30 and 1.30pm.